This Glazed Fudge Birthday Cake is a one-layer chocolate cake mixed in a food processor. The chocolate glaze is rich but not too sweet. It is our favorite birthday cake. What makes a chocolate cake superior? Your requirements may differ from mine. I like a super moist cake with a fairly tight crumb. The texture should not be too heavy or too airy. Furthermore, the chocolate flavor must be intense. What about the frosting, or glaze in this case? Not too thick or too sugary and smoooooth on the tongue. But sometimes, it’s about more than the recipe itself. I made this cake for my husband’s birthday last Sunday. It’s a tradition in our family. Turned out to be a bittersweet celebration because his mother died the day before. Upon closer examination, I noticed a few details. The older lady is my husband’s mother. Anytime she was around her grandchildren, she was happy. Unfortunately, she was diagnosed with a brain tumor last year and the complications finally caught up with her. She was a generous and loving Christian servant. We will miss her terribly. Check out my son’s birthday cake. It’s the same glazed fudge cake I made this weekend. 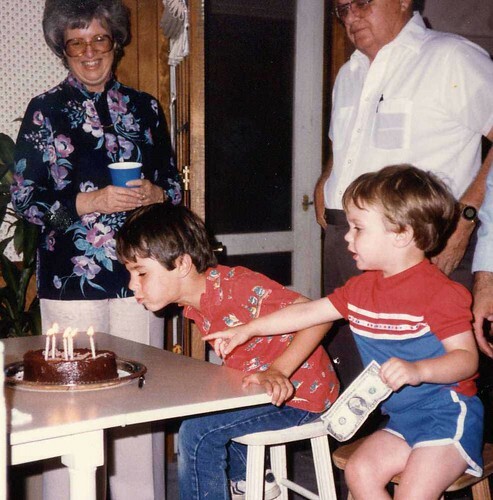 Looks like I’ve been baking this cake for over 20 years. One of my sons is a CPA. Can you guess which one? 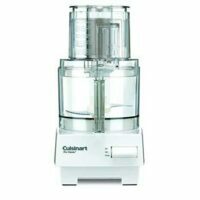 It’s made in a food processor. I acquired the recipe while assisting with a cooking school taught by Abby Mandel. At the time, she had just published a new cookbook called Cuisinart Classroom. This is the only cake recipe I have that is made in a food processor. 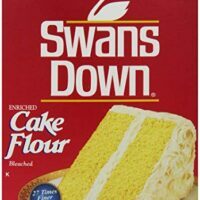 While I’m sure this cake could be made with a regular mixer, I have never tried it myself. 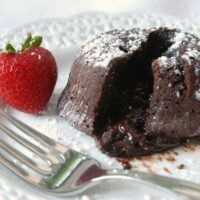 The author originally touted the food processor as a way to make a chocolate cake without melting the chocolate, supposedly quicker and more flavorful. Maybe Ms. Mandel is right. I’m not sure. Nevertheless, the cake tastes fabulous. Can’t argue with fudge-y, moist, and tender. The cake has a tendency to fall slightly. You must use a 9-inch springform pan. Anything smaller and you risk an overflow of cake batter in your oven. On the other hand, you could use an 8-inch pan plus a few cupcakes if you like. You don’t have to use a springform pan. However, the cake is much easier to remove when you do. Be sure to line the bottom as outlined in the recipe. 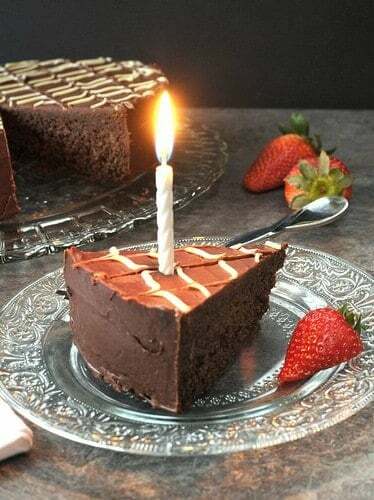 This Glazed Fudge Birthday Cake is a one-layer chocolate cake mixed in a food processor. The glaze is rich but not too sweet. Butter a 9-inch springform pan. Cut a circle of parchment paper or wax paper to fit the bottom of the pan and place inside. Preheat oven to 325 degrees. Place flour, baking powder, baking soda and salt in work bowl of food processor and process 5 seconds to blend and set aside. Place the chocolate and 1/4 cup sugar in work bowl and process 1 minute or until chocolate is finely minced. With machine running, pour hot water through the feed tube and process until the chocolate is melted. Add the eggs and cocoa and process 1 minute. Add remaining sugar (1 cup) and process 1 minute, stopping once to scrape down the inside of the bowl. Add the butter and process 1 minute more. Add rum and sour cream and process 5 seconds. Add the dry ingredients and combine by turning the machine on and off 3 or 4 times until the flour just disappears. Do not over process. Pour the batter into prepared pan and spread evenly with a spatula. Bake for 50 to 55 minutes or until a toothpick inserted into the cake comes out clean. Allow the cake to cool completely before removing from the pan. 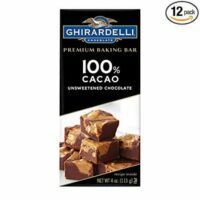 Put the chocolate and powdered sugar in the work bowl and pulse food processor on and off 3 times to chop the chocolate, then process continuously until it is finely minced. With the machine running, pour the hot water and butter through the feed tube and process until the chocolate is melted. Add the flavoring and process for 5 more seconds. Refrigerate the glaze until it begins to thicken then spread over the surface and sides of the cake. To Decorate: Melt 1 1/2 ounce white chocolate in small zippered plastic bag. Make tiny snip across corner of bag. 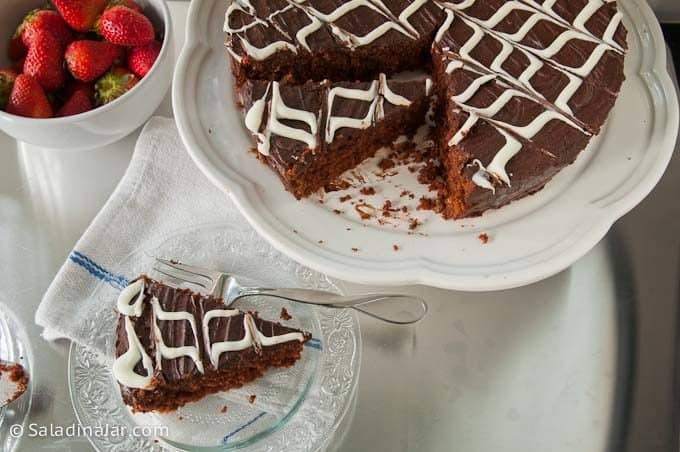 Draw parallel strips across cake. Using thin knife draw lines perpendicular and parallel across white chocolate lines to make a chevron design. 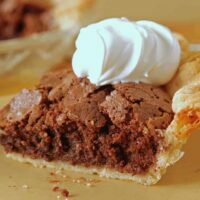 Posts Related to "A Glazed Fudge Birthday Cake"
A fudge-y, brownie-like pie in a classic pie crust. These will remind you of the top of a chocolate cupcake. 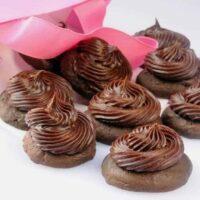 A soft, tender cookie with ganache-like, fudgy frosting. 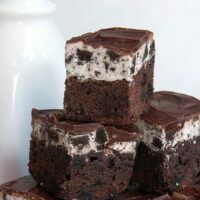 A brownie so rich, it should be served in small pieces to avoid passing out from extreme pleasure. 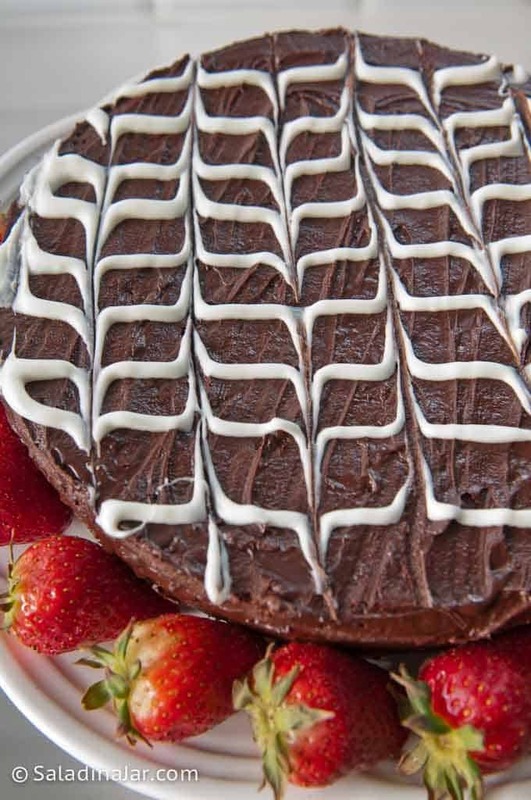 Kay's Swiss Chocolate Cake is a feather-light Swiss chocolate cake (mix) iced with whipped cream. It is my sister's most requested cake. I have made this cake for years, and it was originally printed in an old edition of Cusinart magazine……..and while it may have not been in Abbey Mandel’s book, it certainly was in the magazine…..
Mmmm. Looks fabulous! Abby Mandel was a pretty amazing woman as well. (She was a friend of my mom’s) Nice tribute! Cake looks great and what a beautiful tribute to Jo. I have a food processer so no excuse not to make it. Or at least not that excuse!! I’ve never tried it but I don’t see why not. Let me know how it turns out. Mmm, it looks so nice and chocolatey. Love the decorations, it looks like it came out of a bakery case. It looks like this cake has quite a bit of history with your family; what a fitting tribute to your mother-in-law. It sounds like it’s easy to make it in the food processor! That cake is picture-perfect! 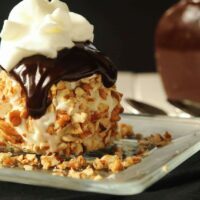 I’ve never even though to make one in a food processor–sounds downright crazy–but I can’t argue with the end results. Sorry about your family’s loss. This is a great poster to remember her. 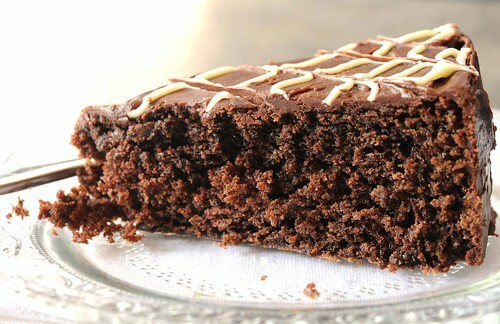 The fudge cake looks fantastic! What a sweet post to your mother-in-law’s memory. I know too well how hard it is to lose someone you love. The cake looks delicious. A lovely tribute to your beloved Mother-in-law. Happy birthday to your Husband. The chocolate cake looks fantastic. I’ve never made a cake in the food processor, I think I’ll give it a whirl. Paula, what a wonderful cake! It’s a beautiful tribute to your mother-in-law and to your SO. What a lucky guy… I’ll have to try this – as I love using other devices other than the KitchenAid! And yes, my luck with chocolate cakes is so-so – they are always “falling” during baking for me for some reason… I’m sure this cake was enjoyed (even more) this year! What a wonderful post. I came looking for cookies but found this first (I am a little late this week, what can I say, it’s been a busy week), and I am so happy I got to see/read this post. What a wonderful tribute to your mother-in-law, she sounds like a lovely person. Happy Birthday to your most significant other, and I am cracking up about the comment about your son being a CPA, guess which one…too too funny! The cake is beautiful, a wonderful tradition. I just realized that I didn’t even wish Billy a Happy Birthday! I’m sure this cake and time with his family helped a difficult weekend.